A unique signature bass made for the working musician. 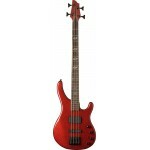 ..
Washburn Signature Series SHB40RS 4-Strings Bass Guitar, Red Sparkle. Perform your favorite tun..